, a German of great abilities and learning, was born at Augsburg in 1532, of very poor parents, and the love therefore of learning, which he discovered from his infancy, would have been fruitless if he had not met with a patron, in Wolfgang Relinger, a senator of Augsburg. This gentleman made him be supported at the public expence, till his progress in literature procured him admittance into the colleges, where the city maintained a certain number of students. In 1549 he was sent to the university of Tubingen, and afterwards to that of Basil, where he became an excellent Greek and Latin scholar. 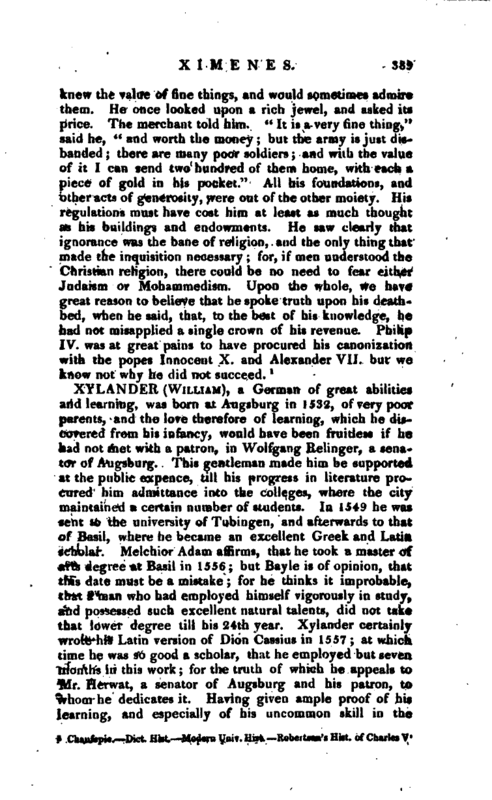 Melchior Adam affirms, that he took a master of arts degree at Basil in 1556; but Bayle is of opinion, that this date must be a mistake; for he thinks it improbable, that a man who had employed himself vigorously in study, and possessed such excellent natural talents, did not take that lower degree till his 24th year. 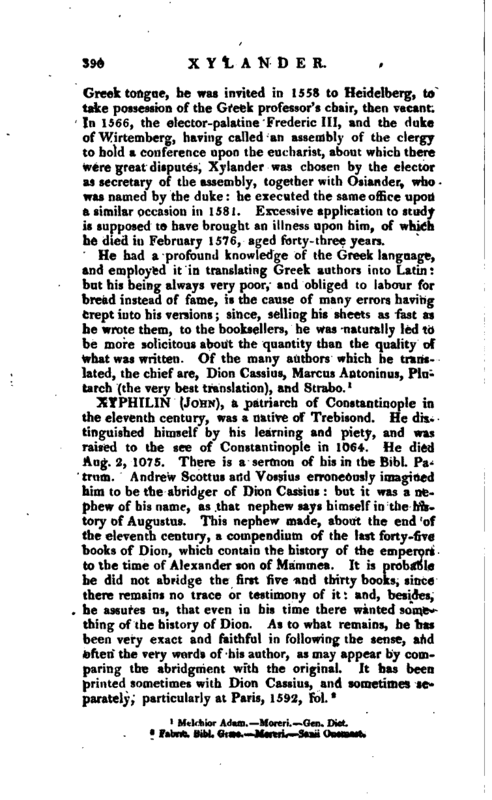 Xylander certainly wrote his Latin version of Dion Cassius in 1557; at which time he was so good a scholar, that he employed but seven months in this work; for the truth of which he appeals to Mr. Herwat, a senator of Augsburg and his patron, to whom he dedicates it. Having given ample proof of his learning, and especially of his uncommon skill in the | Greek tongue, he was invited in 1558 to Heidelberg, to take possession of the Greek professor’s chair, then vacant. In 1566, the elector-palatine Frederic III, and the duke of Wirtemberg, having called an assembly of the clergy to hold a conference upon the eucharist, about which there were great disputes, Xylander was chosen by the elector as secretary of the assembly, together with Osiander, who was named by the duke he executed the same office upon a similar occasion in 1581. Excessive application to study is supposed to have brought an illness upon him, of which he died in February 1576, aged forty-three years.